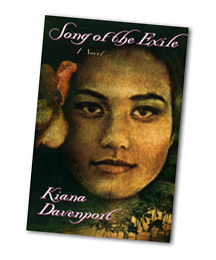 Kiana Davenport and Paul Wood have been named winners of the Elliot Cades Award for Literature, the state's top literary honor. They will accept their awards and read from their works at 7 p.m. Wednesday at Kumu Kahua Theatre. Novelist Davenport is the author of "Shark Dialogues," "Song of the Exile" and, most recently, "House of Many Gods." She lives in New York and Hawaii. Essayist Wood has published two humor collections, "False Confessions" and "Four Wheels Five Corners." He teachers creative writing at Maui Community College. The Cades Award is presented by the Hawaii Literacy Arts Council in honor of Elliot Cades, a teacher and literature lover. Wednesday's reception and ceremony are free. Beef will be prime when chef Alan Wong showcases the North Shore Cattle Co. at "You Like Beef? -- A Sunday Brunch" on July 30 at his Pineapple Room restaurant in Ala Moana Center. On the menu: prime rib, miniburgers, chili, Shabu Shabu Beef Salad, Beef Tartare of Tenderloin and Old-Fashioned Meatball Stuffed Peppers, made with the pasture-raised North Shore beef. The event is the first in a series designed to show off partnerships between chefs and farmers. North Shore Cattle is owned by retired state veterinarian Cal "Doc" Lum on 1,100 acres of former sugar cane land in Waialua. His beef is raised antibiotic- and hormone-free. The brunch will also include made-to-order omelets and a griddle station featuring Beer Sausage from North Shore Cattle. The event runs from 9 a.m. to 3 p.m. Cost is $42, $21 children. Call 945-6573. Alan Wong protégé Kelsi Ikeda presents a four-course Next Generation Dinner July 27 at Wong's King Street restaurant, once again featuring local beef, this time from Maui. The menu: "BLT" Salad with bacon, lobster and Hamakua Springs Heirloom Tomatoes (with Clos du Bourg Gaston Huet Vouvray, 2000), Crispy Soba-Wrapped Onaga (Josef Leitz Riesling, 2004), "Surf-n-Turf" of grilled Maui Cattle Co. Beef Tenderloin and shrimp tempura (Villa Creek "Mas de Maha," 2004) and dessert by pastry sous chef Michelle Karr, a tropical fruit sampler. Cost is $65, $90 with wine pairings. Call 949-2526. The fifth annual Samuel Adams Beer Dinner takes place at 6:30 p.m. July 26 at Indigo Eurasian Cuisine. Samuel Adams brewmasters and Lili Hess, international sales manager for the Boston Beer Co., will host a five-course dinner by Chef Glenn Chu, each course paired with a Samuel Adams beer. The menu: Pan-Roasted Kampachi Infused with Lemon Grass (with Hefeweizen), Garlic-Roasted Spiced Shrimp Pil Pil (Seasonal Summer Ale), Thyme-Infused Grilled Natural Poussin (Boston Lager) and Turkish Pistachio Myer Lemon Chèvre Tarts (Utopias). Cost is $55. Call 521-2900. The Willows' Hops & Grinds monthly beer tasting takes place from 5:30 to 8:30 p.m. Friday. Cost is $25 in advance, including pupu buffet; $30 at the door. Buy tickets at the restaurant, the Liquor Collection, Wine Stop or Tamura's Kaimuki. Call 952-9200. A free half-day program on the "Samoan Cultural Perspective on Death and Dying" will be presented by St. Francis Hospice July 28 at Borthwick Mortuary, 1330 Maunakea St. Registration will begin at 8:30 a.m., followed by a panel discussion from 9 a.m. to noon. The session is designed to provide a history of Samoa, an understanding of the cultural and spiritual practices of the Samoan regarding death and dying and an overview of Samoan values. Panel members will include the Rev. Fuamila Soa Jr. of Windward Samoan Congregational Christian Church; Mataafa Fono Mataafa, social worker and member, Royal Council of Samoan Chiefs in Hawaii, and Merina Sapolu, health educator, Kokua Kalihi Valley Comprehensive Family Services. The moderator will be Tusitala F. Toomata-Mayer, registered nurse and coordinator for Cancer Screening and Education Program, Hawaii Breast and Cervical Cancer Control Program of St. Francis Medical Center. Mayor Mufi Hannemann has been invited to participate. St. Francis Hospice, established in 1978, is the state's first and largest hospice program. Besides providing hospice care to terminally ill patients and their family in a home setting, it operates the Sister Maureen Keleher Center in Nuuanu and the Maurice J. Sullivan Family Hospice Center in Ewa Beach. Thursday is the registration deadline. Call Felicia Marquez-Wong at 595-7566 or e-mail: feliciam@sfhs-hi.org. Grandmaster Hong Liu, a medical doctor in China and a researcher, herbalist and an adjunct professor at the University of Hawaii medical school will teach natural healing approaches to combat asthma and other related-health concerns. The free Asthma Humanitarian events will be held on at 12:30 p.m. Thursday, July 30 and Aug. 19 at the Qi Gong Center at 1110 University Ave. The center says that last year, more than 1,000 asthma and allergy suffers were treated at the humanitarian events, with 81 percent effectiveness. To register call 947-1333 or e-mail honolulu@theqicenter.org.